Optional steel conduit or junction boxes are available. The boxes are painted and mount in holes provided on the motor frame. 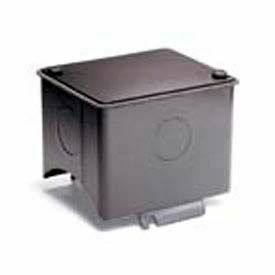 Available Conduit boxes fit 25, 30/31, 34, 38 and 42 Frame motors. Manufactured from #16 gauge, deep drawn cold rolled steel. Coated in oil film to protect from rusting. 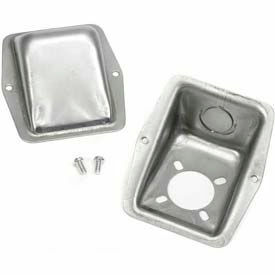 Includes Conduit Box (No Gasket) and 2 screws. Conduit Boxes Protect Equipment In Commercial And Industrial Electrical Applications. All conduit boxes have 1/2-NPT tapped lead exit holes on two adjacent sides with one hole plugged. Available frames include 360T, 320T, 56/140T, 182T-4T, 320, 250, 210T, 180T and more. 56/140-frame kit (pictured) includes die cast aluminum conduit box, cover, gaskets, grounding screw, mounting hardware and adapter plate for mounting box on existing holes in motor. 180 and 210-frame kits include all parts required to replace the conduit box including die cast conduit box, plug, cover, gaskets and mounting hardware. No adapter plate required because these kits mount on existing holes. Note: Kits not compatible with larger HP single-phase 210-frame motors.